Since the inception of the festival on Ram's return from his exile, Diwali has been celebrated with excitement. I, too am always very excited when Diwali time is around. But something has changed in me from past ten years. I have been becoming intolerant to the noise and pollution created by bursting crackers every Diwali. Moreover, I have realized that it is so intoxicating that many of my relatives and friends leave Delhi to spend time away. I know most of you will think that everybody likes to have a vacation. I also used to think the same until I dug deep to find the actual reason. Yes, they ran away from noise and pollution which affected them too much. Children enjoy Diwali, but they are the ones who are one of them who are worst hit. They spend their growing up time in smoke, noise which causes mental and physical disturbances in their minds and bodies. Another age group which is worst hit is the old age people. With lot of harmful chemicals penetrating their lungs while they breathe, they are vulnerable to diseases which are unbearable by them. I stopped bursting crackers a long time back. I just light up the candles, diyas, participate in the pooja and relax at home. But wait, the festival doesn't end here. There is one more thing left unsaid. Almost everybody ignores them. They become silent victims to shock, noise and several other inexplicable reasons. Yes, they are the birds, animals who die every year because of the loudness during this festival. At least one should take into account their feelings, what they will go through before bursting crackers. If you don't get it still, just pay a visit to the hospital near you, you will get to know yourself that what harm it causes. 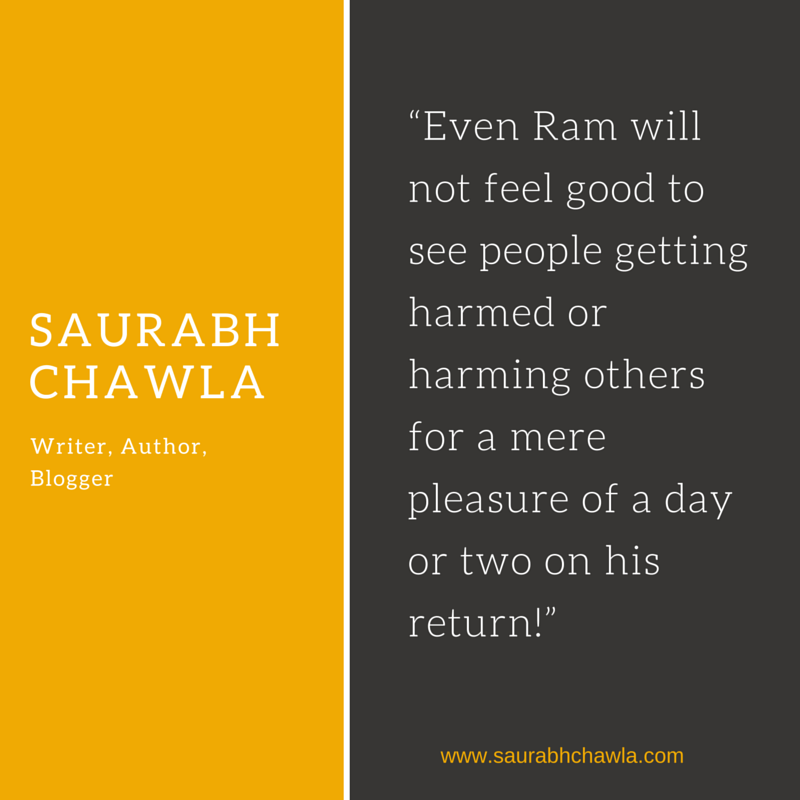 Even Ram will not feel good to see people getting harmed or harming others for a mere pleasure of a day or two on his return! A cute advertisement on this Diwali I learnt from. Do have a look. 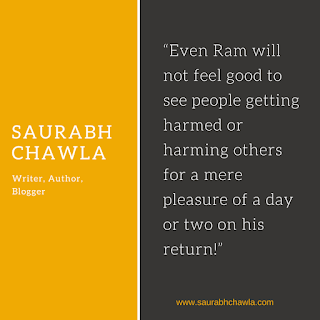 Rightly said Saurabh, each one of us needs to make conscious efforts!